Reading and share top 26 famous quotes and sayings about Entranced by famous authors and people. Browse top 26 famous quotes and sayings about Entranced by most favorite authors. 1. "I was secretly entranced with the idea of a lady novelist. I should dearly love to be one. Or maybe a goblin-fighting-pirate-queen. It was difficult to choose sometimes." 2. "The Cardinal was bent over his writing desk, the room unchanged save for the light of what appeared a small antique oil lamp. And there were illuminated letters in the book before him, tiny figures fitted into the capitals, the whole gleaming as he let his hand, quivering, turn the page. "Ah, think of it," he said, smiling as he saw Tonio, "written language the possession of those who took such pains to preserve it. I am forever entranced with the forms in which knowledge is given us, not by nature, but by our fellow man." 3. "Before you become too entranced with gorgeous gadgets and mesmerizing video displays, let me remind you that information is not knowledge, knowledge is not wisdom, and wisdom is not foresight. Each grows out of the other, and we need them all." 4. "And from that time on I bathed in the Poem Of the Sea, star-infused and churned into milk, Devouring the green azures; where, entranced in pallid flotsam,A dreaming drowned man sometimes goes down." 5. "When I'm into a woman, I literally can't stop staring. I'm like a little kid. I become completely entranced." 6. "When she spoke, Tom held his breath, so eagerly he listened; when she sang, he sat like one entranced. She touched his organ, and from that bright epoch even it, the old companion of his happiest hours, incapable as he had thought of elevation, began a new and deified existence." 7. "Top Gun," I whispered to Lindsey. We'd started pointing out Luc's ubiquitous pop culture references, having decided that because he cut his fangs in the Wild West, he'd been entranced by movies and television. 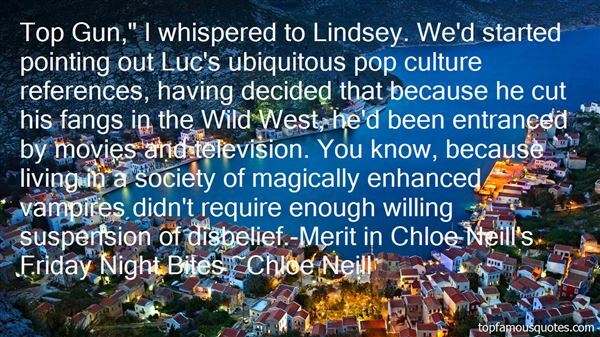 You know, because living in a society of magically enhanced vampires didn't require enough willing suspension of disbelief.-Merit in Chloe Neill's Friday Night Bites"
8. "...and also with sufficient good judgment to appreciate that while he might enjoy the contemplation of his superiority to the masses, there was little likelihood of the masses being equally entranced by the same cause." 9. "He tries to remind himself that there is no reason he should feel guilty about being bound by one woman who is becoming entranced by another." 10. "Everyone whirled around her, entranced by the stories in which they recognized themselves, but in the stories they were also more than themselves and it always felt at the end fulfilled, not meaningless and empty like life can sometimes feel." 11. "The intense clarity of the image failed to satisfy us, for it seemed to hide as much as it revealed; and while it seemed to invite us to pierce the veil and examine the mystery behind it, its luminous concreteness nevertheless held the eye entranced and kept it from probing deeper"
12. "A whole new life at fifty, all because I had become entranced with both the Turkish culture and with Kazim—who one friend called a careening festival of a human being and another called an alcoholic Kurdish carpet salesman. I called him a catalyst." 13. "Reading is a majority skill but a minority art. Yet nothing can replace the exact, complicated, subtle communion between absent author and entranced, present reader." 15. "Oh! 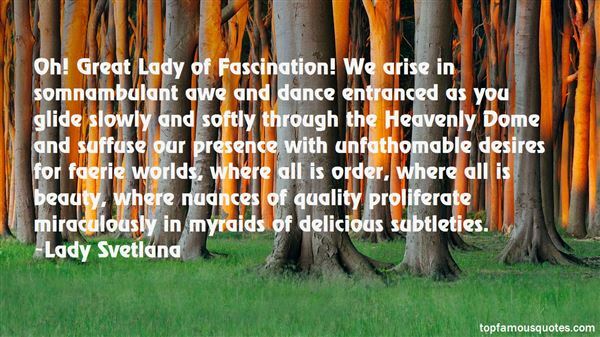 Great Lady of Fascination! We arise in somnambulant awe and dance entranced as you glide slowly and softly through the Heavenly Dome and suffuse our presence with unfathomable desires for faerie worlds, where all is order, where all is beauty, where nuances of quality proliferate miraculously in myraids of delicious subtleties." 16. "I do not yet know why plants come out of the land or float in streams, or creep on rocks or roll from the sea. I am entranced by the mystery of them, and absorbed by their variety and kinds. Everywhere they are visible yet everywhere occult." 17. "I am a man that finds Death beautiful. If I have lived a million lives before this one, I know that I have spent each one searching for Death. It's hard to be entranced by those who aren't your soulmate, which is I why I don't acknowledge those like her, but her. Our hearts are meant to join again. Our souls are meant to join again. I am a man that finds Death beautiful, for Death doesn't wear a mask or lie. She simply smiles, and takes the breath of life away..."
18. "You cannot pretend to read a book. Your eyes will give you away. So will your breathing. A person entranced by a book simply forgets to breathe. The house can catch alight and a reader deep in a book will not look up until the wallpaper is in flames." 19. "The candle's flame washed her in a sensual bath of pulsating light, and Hans became entranced by the soft glow upon her skin." 20. "In other cases, when the medium becomes entranced, the demonstration of a communicator's separate intelligence may become stronger and the sophistication less." 21. "Excuse me, Ms. Matthews; you are going to be late for class if you don't get going. Can you read the map, or are you already lost?" the stern voice of the secretary pulled me out of my stupor. "Um, no, I can read," I said, sheepishly, still unable to take my eyes off the mysterious boy staring back. "Of course, you can read," she said sharply, snapping my entranced head back to reality. "Now, get to class." 22. "In later life I have been sometimes praised, sometimes mocked, for my way of pointing out the mythical elements that seem to me to underlie our apparently ordinary lives. Certainly that cast of mind had some of its origin in our pit, which had much the character of a Protestant Hell. I was probably the most entranced listener to a sermon the Reverend Andrew Bowyer preached about Gehenna, the hateful valley outside the walls of Jerusalem, where outcasts lived, and where their flickering fires, seen from the city walls, may have given rise to the idea of a hell of perpetual burning. He liked to make his hearers jump, now and then, and he said that our gravel pit was much the same sort of place as Gehenna. My elders thought this far-fetched, but I saw no reason then why hell should not have, so to speak, visible branch establishments throughout the earth, and I have visited quite a few of them since." 23. "Anyone who has become entranced by the sound of water drops in the darkness of a ruin can attest to the extraordinary capacity of the ear to carve a volume into the void of darkness. The space traced by the ear becomes a cavity sculpted in the interior of the mind." 24. "In thirty seconds you will wake up," said Aziraphale, to the entranced ex-nun. "And you will have had a lovely dream about whatever you like best, and—""Yes, yes, fine," sighed Crowley. "Now can we go?" 25. "Had the girl had any common sense, she would have dropped the line at once. But she had no sense. She made no sense. She was a pale English rose of a governess, adrift in a watery wilderness, on her way to a grueling post on a godforsaken island, when any fool could have told her-a woman so lovely need never work for her keep.Had the men around her any sense, they would have cut the rope immediately. 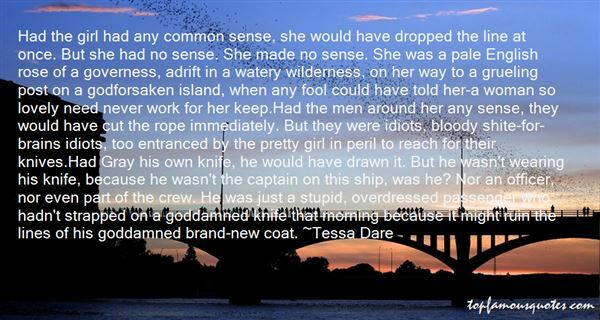 But they were idiots, bloody shite-for-brains idiots, too entranced by the pretty girl in peril to reach for their knives.Had Gray his own knife, he would have drawn it. But he wasn't wearing his knife, because he wasn't the captain on this ship, was he? Nor an officer, nor even part of the crew. He was just a stupid, overdressed passenger who hadn't strapped on a goddamned knife that morning because it might ruin the lines of his goddamned brand-new coat." 26. "How did we suddenly become entranced with gangster culture? I saw it this morning on campus. When did the black community say we should all look like criminals?" As they'd agreed the night before on their cold balcony, scripting out this dialog, there would be three large lies in this conversation. This was the first."